After moving to close to Perth we were eager to explore the local area and find out what was on our doorstep. We discovered that the Fair City has so much to offer and a calendar of events to easily rival that of Edinburgh and Glasgow, even in winter. Toward the end of our first (and very wet) winter we were excited to visit Scone Palace – Celebration of Snowdrops, especially as admission to the grounds are FREE. Just a short drive out of Perth city centre, Scone Palace has played a huge part in Scotland’s history. In 1306, Robert Bruce was crowned here and 1651 saw the last coronation in Scotland when Charles II was crowned King of Scots. The long drive from the main road was laid for the visit of Queen Victoria in 1842. It is said that the Queen’s carriage was unable to pass through the arch that still stands on the original driveway and this was for just a one night visit, enroute to the Highlands. The palace sits on it’s pedestal surrounded by acres of landscaped gardens, a pinetum, fields, a kitchen garden and a maze. Something to be enjoyed all year round, starting with the snowdrops. We all know that warm feeling of spring is on the way when we see our first snowdrops of the year. Some of us might have a few in our own gardens or be lucky enough to see carpets of them in the local parks and woodlands but seeing their wee white heads bob on a gentle breeze is heartwarming. On arriving at the main gate to the palace we drove the long drive, following in the footsteps of royalty and parked up in the car park. At the small ticket hut from where you would normally pay your entrance fee, maps were available, so as first time visitors we had no problem navigating our way around the grounds. 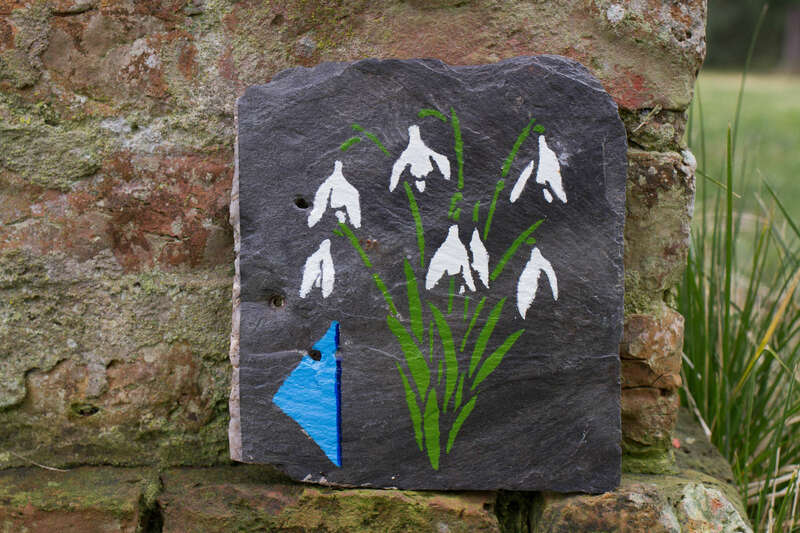 Actually the trail was easy to follow as there were decorative pieces of slate painted with snowdrops to guide us around but you can pick and choose which route you prefer or be a devil and wander aimlessly. At this point I have to admit I was distracted by the impressive selection and enormity of some of the pines planted – giant redwoods, douglas firs and THE most beautiful western red cedar. It is so enormous that it actually looks like several different trees but if you venture through the branches you can see it is just one. It’s incredible. 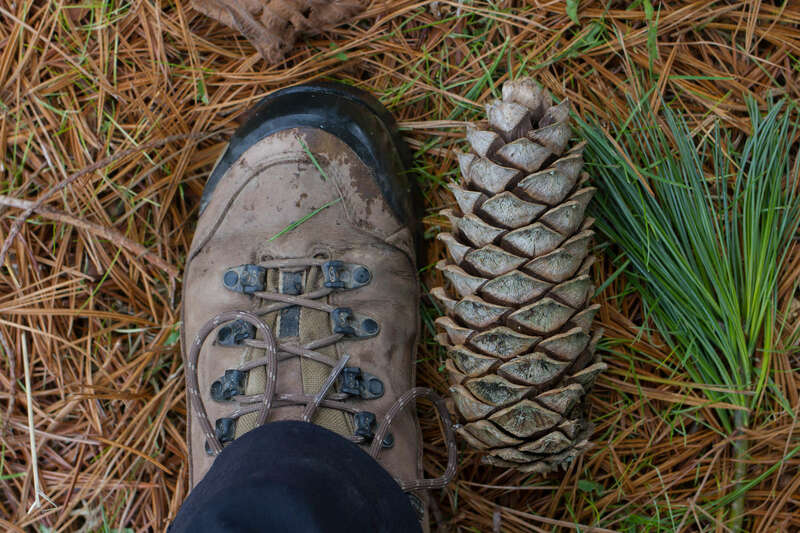 We found some of the largest pine cones we have ever seen. To give you an idea of scale my feet are a UK size 5! There are signs of maintenance throughout the pinetum with large felled trees. Fascinating to see the inside of a tree and the smell is lovely. We were happy to discover a red squirrel going about it’s business too. We stood still and quiet and he/she wasn’t really that bothered by us and came quite close. The snowdrop trail takes you through the Kitchen Garden, where we saw a sign about volunteering and I think I might give this a go. I can see myself pottering about, weeding and sowing seeds for this years produce for the palace kitchens. From garden to plate would be about 200 metres. 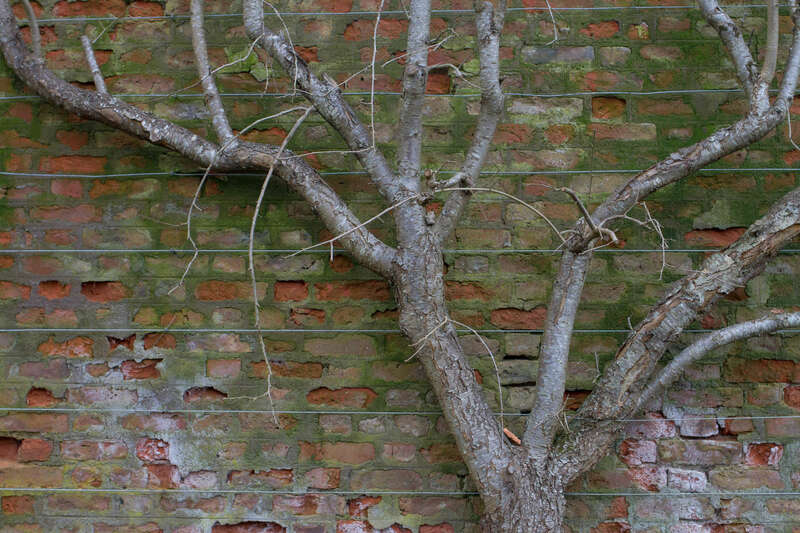 I was quite taken by, what I think is a fruit tree, growing along the wall. I like the different textures and lines. As the trail re-enters the main grounds there are signs of spring everywhere. Obviously the snowdrops but we also spotted daffodils, buds on some of the trees and rhododendron bushes. We also found large patches of snowdrops which make quite an impact. With no wind today their little head’s were so still and we were able to admire their beauty. There are signs of wildlife all around the grounds and we saw people taking advantage of this lovely day and who were out with their spotting scopes hoping to catch a glimpse of the rather rare Hawfinches that live here. If you do plan on visiting and you do have some binoculars I would recommend taking them, just in case! We finally found ourselves facing the palace and it is rather impressive, although closed for the winter, the doors normally opens at Easter. We didn’t par-take in the scones at Scone in the Old Servants Hall coffee shop but it really does look most welcoming. We admired the chapel and the Stone of Scone (which is now a replica replacement), following in the footsteps of the Kings of Scots and the site of their crowning’s. It’s quite special. The palace is also home to very regal peacocks, including an albino. All happy to have their photo taken by visitors. 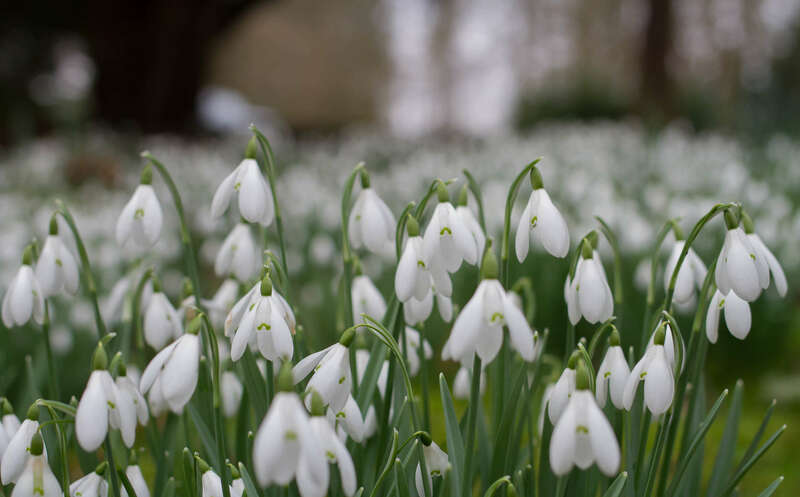 If you find yourself at a loose end over the next few weekends I highly recommend taking a trip just outside the city of Perth to Scone Palace – Celebration of Snowdrops. Starting on the 1st February 2019 and open each Friday, Saturday and Sunday until the 10th March. Will you take on the Maze? It is a great place for families, couples and walking the dog (the website states dogs must remain on the lead) and if you have a camera you will have a field day. Enjoy. It was beautiful and made better by it being for free! This weekend we have also seen daffodils and crocus’ that are out. That peacock is stunning and I adore the photo with the snowdrops. How did you manage to blur out the background so well? The peacocks were beautiful and happy to pose too. It’s called depth of field and I am kneeling on the floor and have my camera focused on just the front few snowdrops. This makes them look blurred – non of it is done when I edit.